Don't let uncorrected visual problems limit your child's potential! Most of the time children do not understand what it means to have blurry vision and they can start to struggle with school work, sports and social activities. Undetected eye and vision problems can cause developmental delays and are best corrected if caught early. 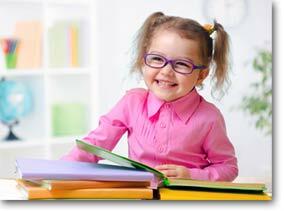 With proper diagnosis and treatment, your child can overcome their vision problems and gain confidence! Make sure your child has clear, comfortable vision to unlock their potential.